Prime Minister Theresa May wants Britain to be a "global leader in free trade" after Brexit, she said on Saturday (Sep 3), hailing a "golden era" in ties with China before travelling to a G20 summit. The prime minister spoke before boarding a plane to China, where she will hold her first meeting as leader with President Xi Jinping amid speculation she could cancel construction of a new nuclear plant with huge Chinese investment. May, who took office in July after Britain voted to leave the European Union in June's referendum, will also meet a string of world leaders including US President Barack Obama on Sunday. Her government is still working on its vision for how Britain's relationship with the EU should look post-Brexit. Downing Street said after a meeting of ministers this week that it wants immigration controls while retaining strong trading ties. May says she will not trigger the formal process for leaving the EU before the end of this year. "This is a golden era for UK-China relations and one of the things I'll be doing at the G20 is obviously talking to President Xi about how we can develop the strategic partnership that we have between the UK and China," May said in a pooled television interview. "But I'll also be talking to other world leaders about how we can develop free trade around the globe and how Britain wants to seize those opportunities. My ambition is that Britain will be a global leader in free trade." 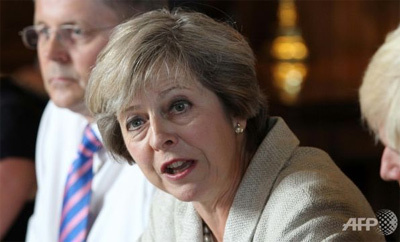 May meets Xi on Monday and her government is expected to make an announcement on whether the Hinkley Point nuclear development will go ahead later this month. A review of the project, a flagship deal building ties with China agreed under her predecessor David Cameron, was announced shortly after she took office./.